Fire! All your little fire fighters spring into action and slide down the fireman pole. It’s the best way to make a quick escape from the treehouse. 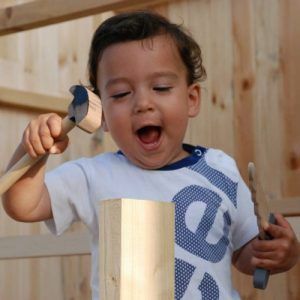 Ideal for social pretend play and building gross motor skills. 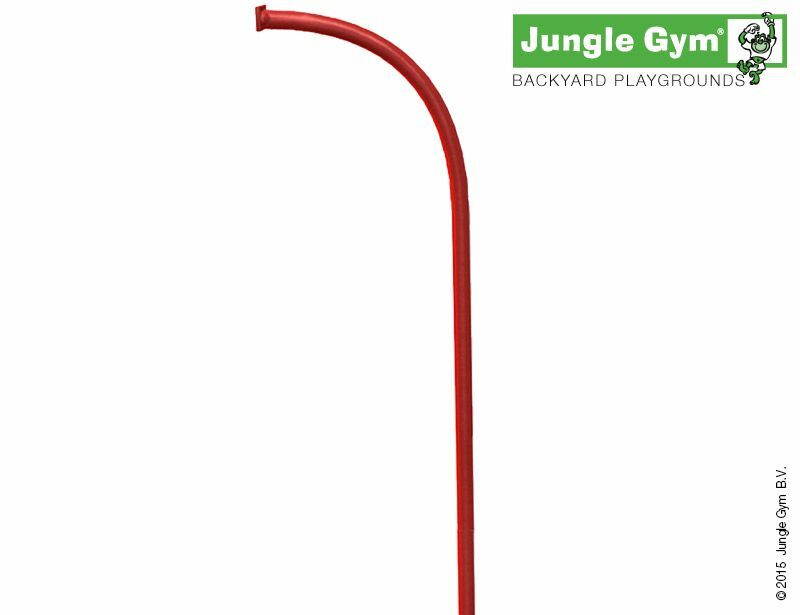 This Fireman Pole is a colourful and sturdy addition to any play tower and provides a thrilling exit. It is excellent for developing upper body strength and coordination while encouraging social pretend play. The pole can also work as a great space-saver when taking the place of a slide. It is made of galvanised, powder-coated steel, and is firmly anchored for optimal safety. Is a fireman pole not exactly what you’re looking for? 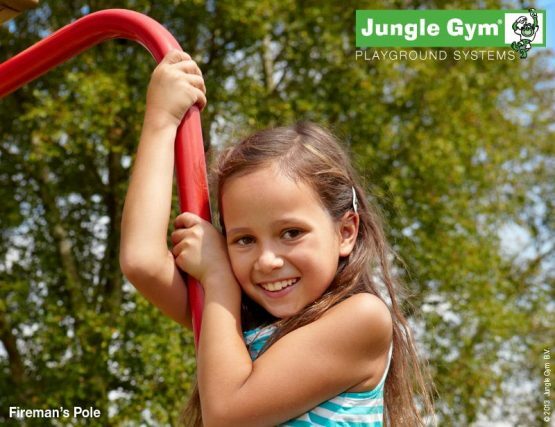 Check out our other playground accessories here. UAE: FREE delivery & installation. International: Please contact us to request a shipping quote. Modules can be combined and modified to fit your adventure. Don’t forget to add some fun accessories. Designs incorporate the latest European safety directives to ensure the safety of your children. Our playgrounds are installed with weather & insect resistant pressure treated pine from renewable sources. The moment Paul visited for the first time & showed his dedication in customising the play area to fit our garden, I knew the results would be of top quality! I was right, I can't explain how beautiful the wood is & how everything flows smoothly with the garden design. My triplets can't get enough of the tree house and the triplets swings. Whether it's hot or cold, we're always enjoying our time at our own garden, thanks to Paul for providing such beautiful work. Have to say thanks to Paul and the team at BoomTree Dubai. Paul was ultra helpful with price and brochures plus their website is good. He came round, measured the space and even customised what we wanted to fit the area. Got a quote that same night, the installation day was set only 10 days later, he even updated me through the production process with pictures, stuck to the date, turned up on time and was clean and tidy!! Awesome job, nice chap, quality product, service was superb and all from seeing a link on Facebook. I had the pleasure to work with BoomTree for Jungle Gym units in the outdoor areas for our Odyssey Nursery. BoomTree delivers excellent service and quality products. A very personal care is taken by the founder Paul in making sure of a tailor made product before and after sale. You can rarely find this in Dubai anymore. Very professional, top quality, excellent workmanship and always with kids' safety in mind!! BoomTree has great customer service. The team was on time from the first assessment and they were definitely the most flexible to deal with. Our set was quickly customized and assembled to the specs we wanted given available space and children ages. Amazing team when it came to execution! There could not have been closer supervision. Owner (Paul) worked next to the team side by side. Even when we encountered some last minute space restrictions due to a trampoline I was installing the same day, they gladly found a solution. Work was smooth and neat. We are very happy with our purchase and highly recommend BoomTree Adventure Playgrounds. Today I had a professional and talented team at my back yard to install a customized play area for my children. It was perfect and installed very well and solid. My children loved it and tried it before its done. Thank you for your professional work Mr. Paul and the team. Highly recommended. These rubber playground mats are designed to provide ultimate safety and provide protection from falls. PRICE PER SQM. This wooden outdoor play equipment comes with a cute picnic module and many fun features like a Staroscope™and a curvy water slide. Experience success, learn from losing and share it all whilst playing with your friends. An exclusive outdoor climbing frame with fun features including a Bucket, Lift strap, Steering wheel, Sandpit and curved slide. A full option wooden climbing frame with slide and a climbing option. Comes with plenty of playtime accessories including a sandpit and steering wheel. This popular play equipment is a medium-sized climbing frame, with a sloping wooden roof, a children’s slide and a sandbox.